Chef Pete Evans lives the life. As an Aussie TV chef and resident of Bondi Beach in Sydney, he can grill with amazing fresh ingredients almost year-round. But no matter how long your grilling season is, you’ll love his new book, My Grill, packed with simple and delicious recipes. Pete likes this method of grilling chicken because it keeps the meat moist and gives it a fantastic flavor. Combine 2 seeded red serrano chiles; the peel from 1 preserved lemon, diced; 1 finely chopped garlic clove; 4 rosemary sprigs, finely chopped; 2 tablespoons softened butter; juice of 1 fresh lemon; and a large handful of fresh parsley, finely chopped, in a bowl. Mix well. Lift the skins of 4 (1-pound) small chickens, poussins, or Cornish hens, butterflied; push the flavored butter underneath. Refrigerate the chickens until the butter is firm. Preheat grill to medium, and place an outdoor griddle on grill to preheat. Cook the chickens, flesh side down, on griddle for 6 minutes; turn and cook for another 6 minutes, or until cooked through. 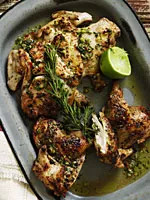 Serve the chickens with lime wedges; garnish with rosemary sprigs.